Apple stock is spectacularly cheap, and sales growth could improve going forward. Is this a buying opportunity for investors? Investors in Apple (NASDAQ:AAPL) are going through considerable pain. Shares of the tech juggernaut are down by over 20% in the past year because of fears over declining revenues. On the other hand, the stock looks quite undervalued at current prices, and there are reasons to believe that financial performance could improve over the middle term. If that happens, the recent decline could turn out to be a buying opportunity. Let's take a closer look. Apple is currently trading at a price-to-earnings ratio of 10.6 times earnings over the past year, a massive discount versus an average P/E of around 19.4 for companies in the S&P 500 index. Companies in the hardware sector typically trade at below-average valuations because financial performance is usually unstable and hard to predict in the business. However, Apple is also notoriously cheap by historical standards. 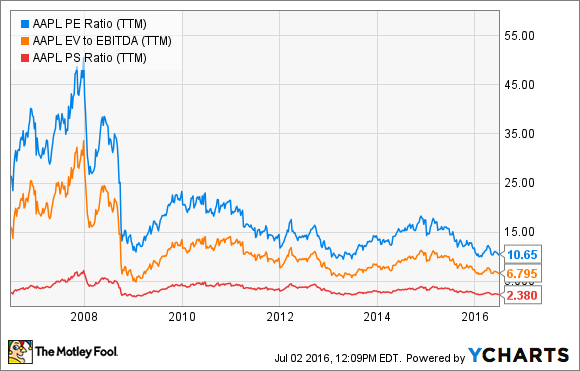 The following chart shows different valuation ratios for Apple over the past several years, including price to earnings, enterprise value to EBITDA, and price to sales. A picture is worth a thousand words, and the chart is telling a clear story: Apple stock hasn't been this cheap since the depths of the Great Recession in 2009. A dirt-cheap valuation reflects that expectations are quite dismal for Apple going forward, and this has important implications for investors in the company. If Apple can do better than what the market is expecting, then the stock could offer considerable upside potential from currently depressed valuation levels. The main reason for all the negativity surrounding Apple is falling revenue on the back of declining iPhone sales. Total revenue during the quarter ended in March -- meaning the second quarter of fiscal year 2016 for Apple -- was $50.56 billion, a 13% decline versus the same quarter in 2015. Adding to the concerns, management guidance for the June quarter implies a 15% decline in total revenue at the midpoint of the guidance range. The iPhone brings in nearly 65% of total revenue for Apple, so this segment is crucial for the business. Overall smartphone industry growth is slowing down because of increasing market penetration over the past several years. Moreover, the iPhone 6 was an explosive success for Apple in 2015, making year-over-year comparisons particularly tough in 2016. The company sold 51.2 million iPhones last quarter, a 16% decline versus the same period in 2015. While management doesn't provide specific sales guidance for the iPhone, chances are that the modest revenue guidance for the June quarter is based on weak sales expectations for the device. The main question to consider is whether Apple is facing a permanent decline or if current problems are mostly temporary. The future can never be predicted with certainty, especially in the dynamic and ever-changing tech industry. Nevertheless, even if the high-growth era for Apple is already in the past, the most likely scenario is that growth will improve going forward. It's important to consider the numbers in perspective, not missing the forest for the trees. Because of avid demand for the iPhone 6, Apple sold 61.2 million devices during the quarter ended in March 2015, a huge 40% increase versus the same quarter in 2014. Unit sales during the quarter ended in March 2016 are down 16% from the same quarter in 2015, but they're also still up by 17% versus 2014 levels. This is important, because it indicates that the decline in iPhone sales this year could be mostly due to tough comparisons against 2015 levels. In addition, Apple customers are remarkably loyal to the brand, and a gargantuan installed base should produce accelerating growth once those customers start upgrading their models over the middle term. iPhone SE sales weren't included in financial reports for the March quarter, but CEO Tim Cook said in the conference call that demand for the revamped 4-inch device is exceeding supply. The iPhone SE is priced at a comparatively low starting at $499, and the product seems to be specially designed to gain market share in emerging markets, where income levels are lower and Apple products are too expensive for many consumers. If the iPhone SE turns out to be a success, it will allow Apple to gain ground versus the competition in emerging markets, which could have a major positive impact in terms of overall revenue growth. The market tends to overreact to negative news in the short term, and this seems to be the case when it comes to Apple. The stock is ridiculously cheap, and sales trends could improve going forward. If anything, the recent decline in Apple stock looks more like a buying opportunity than a reason to sell.